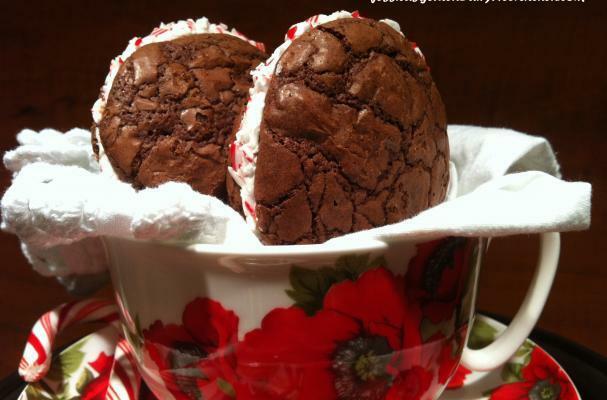 Foodista user Jessica Glick from Jessica's Gluten Dairy Free Kitchen shares one of her favorite holiday treats - gluten-free chocolate peppermint whoopie pies. This dessert suits everyone, even those with dietary restrictions. Fudgy chocolate cookies are sandwiched together with peppermint cream and then rolled in crushed candy canes. These whoopie pies are absolutely a delight and perfect for the holidays. Fill a medium saucepan (relatively the same size as the bowl) about 1/3 full with water and set over medium heat. In a medium glass bowl, combine the bittersweet chocolate, semi-sweet chocolate and shortening. When the water simmers, place the bowl of chocolate and shortening over the simmering water and lower the heat. Make sure your bowl does not touch the simmering water. The more you stir the shinier your cookies will be. When the chocolate and shortening has melted, remove the bowl from the heat; stir to assure it's completely mixed. Set aside to cool a few minutes. Meanwhile, in another bowl, whisk together the sugar, eggs, vanilla paste, and espresso. Set aside. In another bowl, sift together the flour, cocoa powder, baking powder and salt. Set aside. Whisk the melted chocolate into the sugar/egg mixture. Add the flour mixture, whisk. Only whisk until blended, over-mixing can affect the texture of the pies. Line 2 baking sheets with parchment paper, no need to grease the paper. Drop a heaping tablespoon of batter (keeping the shapes as round as possible) onto the baking sheets. You are aiming for rounds that are about 2 inches in diameter. Take care to leave some room (about 2 inches) between each one to allow for spreading that will occur as they bake. Leave in the oven an additional minute if they seem under baked. The cookie will have a brownie like crackling surface, and will feel soft, when ready. Allow them to cool for about 10 minutes before gently lifting them off the baking sheet and onto a flat surface for piping the filling. Combine 1 1/4 cups sugar and the water in a small saucepan. Heat over medium heat with a candy thermometer attached to the inside of the saucepan, and stir to dissolve. When the mixture reaches 220 degrees F it is ready for the stand mixer. Meanwhile, in a bowl of a stand mixer fitted with the whisk attachment, whisk the eggs on medium speed until it begins to look very foamy(about 3 minutes). Avoiding the whisk, gradually add the remaining 2 tablespoons PLUS 1 teaspoon sugar. Increase the speed to high and whip until soft white peaks are formed. At this point check to see if your sugar has cooled. If it has cooled, turn heat back on to high until it comes back up to 220 degrees F just before adding to stand mixer. When egg whites are at a soft peak stage resembling marshmallow fluff, slowly add the hot sugar along the edge of the mixer avoiding the whisk. Continue to whisk on high until the bowl has cooled, about 5 minutes. Add peppermint extract, whisk another 30 seconds. Refrigerate for 5 minutes before transferring to a piping bag with a plain tip attached or a large ziploc bag with one corner cut a 1/4 inch. Place candy canes between layers of wax paper, then sandwich between a dish towel. Using a meat tenderizer, or the back of a dry measuring cup, pound the candy cane until broken up into very small pieces. Make sure the candy cane is between wax paper first, otherwise, the candy cane will stick to the dish towel. Turn the brookie cookies upside down, pipe about 2 tablespoons of filling onto half of the cookies. Cover each filled cookie with a dry cookie, press down just enough so that filling adheres to the cookie. Sprinkle crushed candy cane around the brookie pie edges.